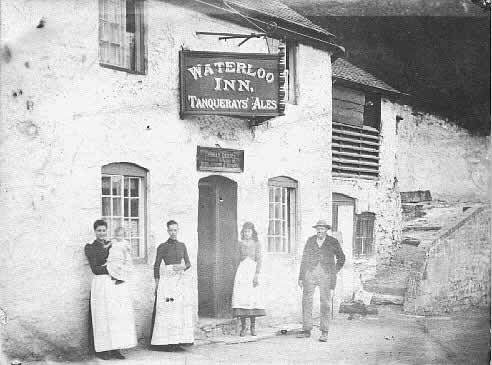 Llangollen and Llantysilio have been renowned through history for their hotels, inns and public houses, both for the quality of the local beer and for the sheer number of places where it was possible to buy a drink. At the end of the 19th century there were over 35 pubs and hotels, 3 beer retailers, 5 brewers and 1 wine and spirit merchant in this small area. 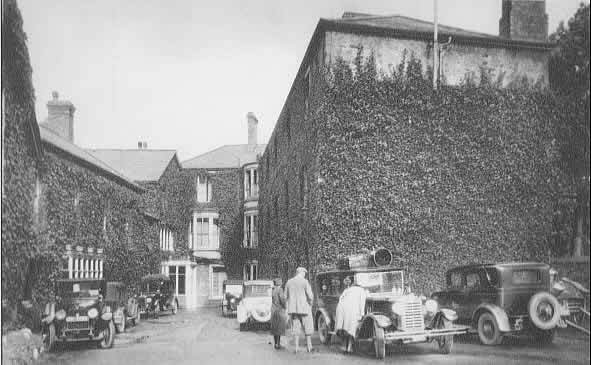 The Hand Hotel was most probably ‘the great house’ referred to in the Chirk Castle accounts of 1684 and was one of the principal coaching inns of the town in times when the main London to Holyhead road ran past the door.. The name of the inn comes from the red or bloody hand, the crest of the Myddletons of Chirk Castle. In 1752 the Hand was an Inn kept by Thomas Edwards and in the 1780s the Ladies of Llangollen refer to Mr Edwards of the Hand begging them to use his pew in the church. The diary of John Hughes from the 19th century tells us that ‘1810-1815 the Hand Hotel was enlarged, and K, Uncle’s house was added to it, and all the small houses from C to H were levelled down’. The 1830 Pigot’s Directory shows Jos Phillips owning the Hand Hotel. Sometime in the following 14 years Jos died, but the hotel continued to be run by his widow Amy Phillips. Amy died in 1859 and the hotel was sold to the Edwards family. 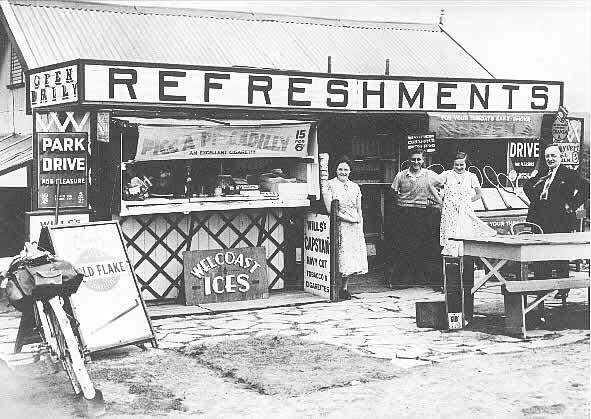 Harriet Edwards managed the hotel in the 1880s and was succeeded by Anne Edwards. Around 1900 the Hand was again sold, being purchased by J.S. Shaw who had previously run the Royal Hotel. He remained the proprietor until the 1930s being succeeded by J.A. Begg and later, in the 1950s by Mr and Mrs Alfred Brown. The Wynnstay Arms was another coaching inn, probably built in the 17th century. The steps up to the entrance formed a mounting block for horse riders. 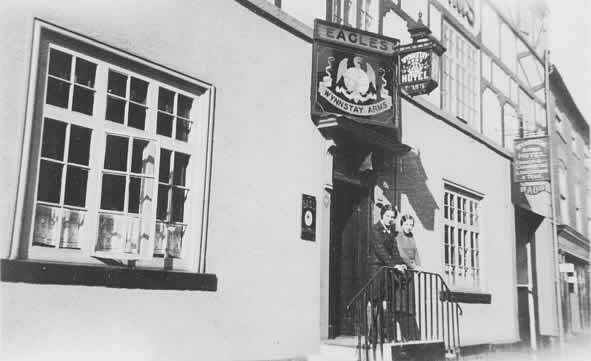 Until the early 20th century it was known as the Eagles Inn, so named from the spread eagle that formed part of the coat of arms of Sir Watkin Williams Wynn of Wynnstay who owned the land. In the alehouse register of 1752 John Simon is recorded as being the landlord, but by the 1830s the inn had passed into the hands of Thomas Pugh and his wife Margaret. In 1845 Thomas Pugh died and Margaret continued as landlady until around 1860 before handing over to their son Samuel, who’s wife Sarah had died 8 years before. Samuel Pugh continued at the Eagles Inn for another 30 years, marrying for a second time to Mary. 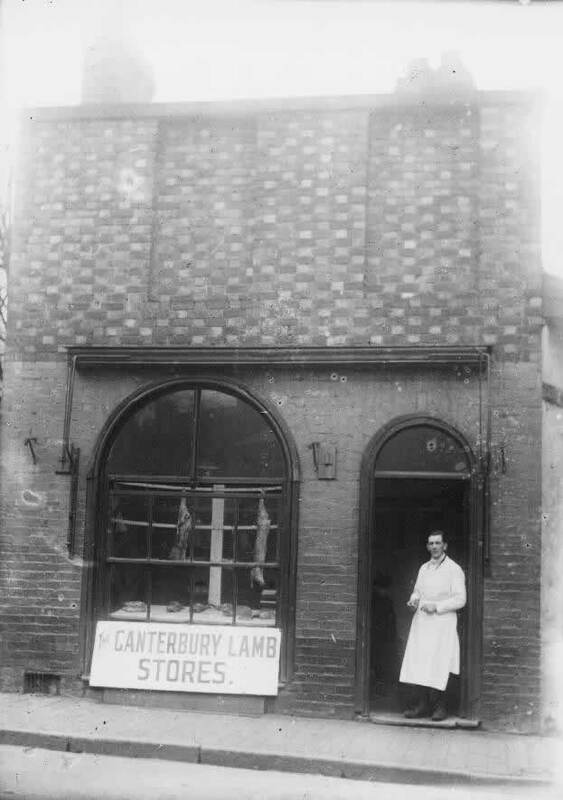 Samuel died in 1890 and Mary ran the inn for another 5 years before selling to Godfrey Tamlyn Allen. In the same year of 1895 their grandaughter Sara Corwena Magdalena Pugh Jones was born to their daughter Anne and her husband John Ivor Jones. Sara Pugh Jones went on to become well known in Llangollen and was founder and publisher of the Tuesday Review newspaper. 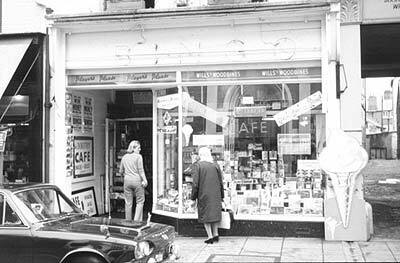 Godfrey Allen was a well known figure in the town and had previously been landlord of the Ponsonby Arms. His father was mentioned by George Borrow in his book Wild Wales as Mr A___ and he himself was an expert on angling in the Dee valley and local history. 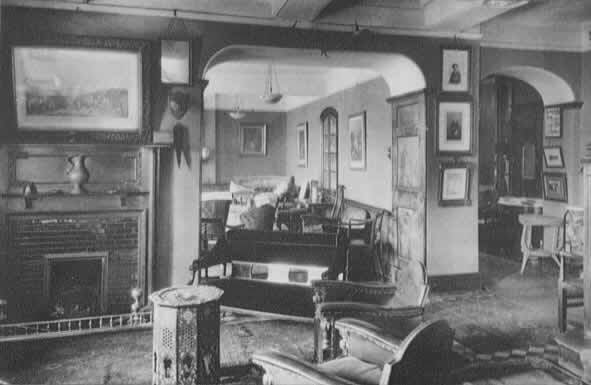 After his death in 1908 his widow Alice stayed at the hotel for another 11 years before selling the premises for £1900. The Royal Hotel was previously known by the name of the King’s Head and is listed in the register of alehouses in 1752 under this name. The Irish Poet Daniel O’Connell stayed there and wrote a short poem attributing the existence of the Inn to the Ladies of Llangollen, evidently incorrect as the Ladies did not arrive in Llangollen until 1778. The hotel was re-built and enlarged in 1815 and was used by the Ladies of Llangollen and their guests. Originally known as the King’s Head this was an important coaching inn. I The hotel was re-named after the visit of the young Princess Victoria in 1832. 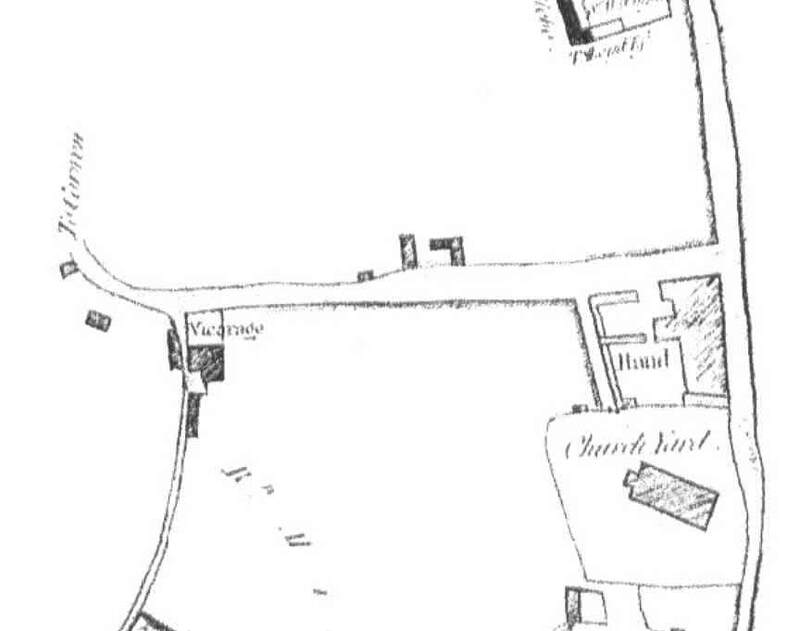 Shown on a 1791 map as the vicarage (see map right), by 1810 the building had become the George and Dragon Inn. 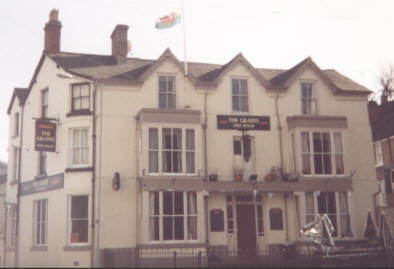 By 1825 it had changed name to the Grapes Hotel, which it remained until 2002 when all except the frontage was re-built and converted into private residences. The early history of the Bridge End Hotel is difficult to determine exactly. 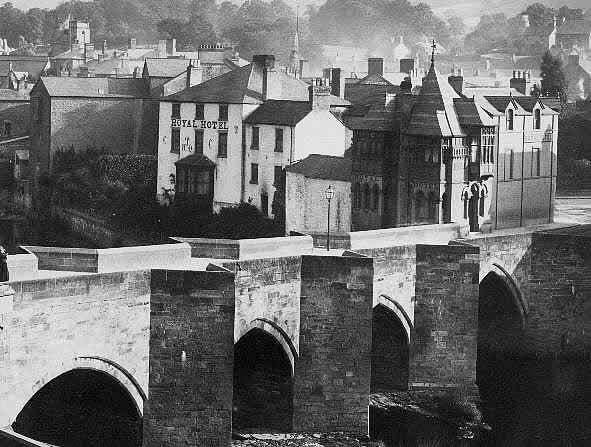 Early 18th century paintings of Llangollen appear to show no buildings at the northern end of the bridge. A map from 1791 does show a building but this may be the Bishop Trefor next door. 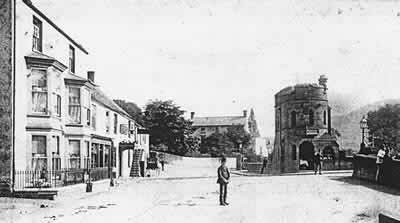 The Bridge End Hotel first appears in records in the 1840s, both in Pigot’s business directory and on the tithe map. 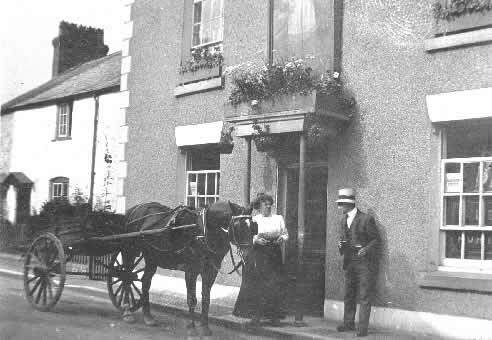 At this time the inn was owned by John Jones of Rhysgog and run by Robert Wright. He was succeeded by Richard and Mary Parry who were in turn followed by Eliza Whittaker in the 1880s, paying an annual rent of £37 to Martha Baker. At this time both sides of the inn were two storey buildings, with the upstairs on the right hand side reached by an external stairway. At the end of the 19th century, however, the left hand part of the inn was raised to three stories and a new chimney installed in front wall of the right hand side. In 1927 the right hand half of the inn was also raised, the chimney first being taken down and rebuilt onto the new taller building. Eliza Whittaker was followed by Piercy J. Pace and A.W. 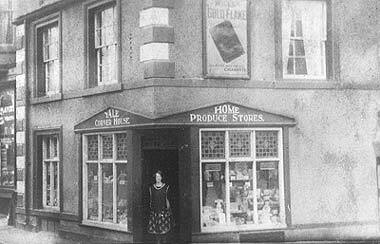 Crowhill before S.R. 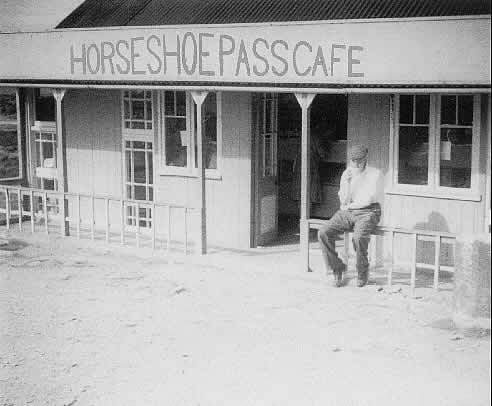 Johnson moved from the Royal Hotel to manage the inn in the 1930s. The Brittannia Inn was possibly built as early as the 13th century, although nothing now remains from this period. It could originally have provided extra accommodation for the monks from Valle Crucis Abbey. Brewing ale was a tradition in the monasteries and the water in the falls next to the inn provided an excellent source for this purpose. After the dissolution of the monasteries in the 16th century the Brittania would have continued to operate as a free house for travellers on the road between Llangollen and the Vale of Clwyd. The Britannia Inn first appears in written records in the census of 1841 when Robert Crow was the publican. The Inn and the land around, including Ty’n y Pistyll, the house behind the inn, was owned by John Crow – most probably a relation. 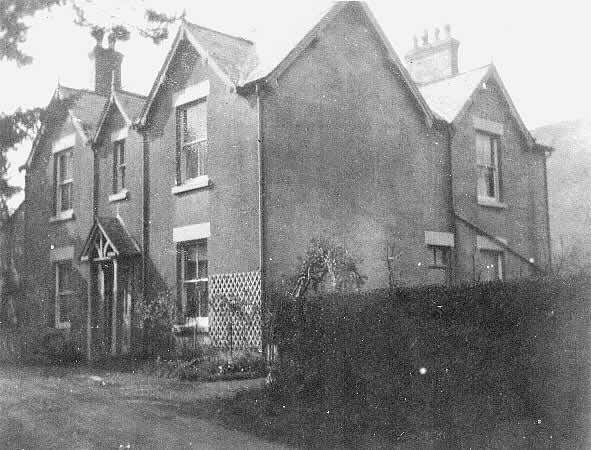 The Abbey Grange was built in 1879 by Mr Trevor Hughes, son of the Reverend Rhys Hughes, Rector of Newborough. Rhys Hughes had inherited Valle Crucis Abbey from his mother Elizabeth when she died in 1839. In the trade directory of 1886 Edward Parry is listed as owning the Abbey Grange, which was then rented out as apartments. Edward Parry lived there with his wife Elizabeth and their daughter Mary Jane. Their son Robert had died the year before, aged 22. 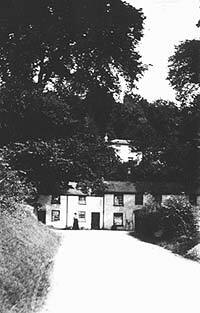 By the turn of the century, however, the Parrys had moved to Trefnant and in 1904 Edward Parry died. In 1909 the Abbey Grange was purchased by Lloyd Hughes, a businessman from Caernarfon, who rented it to William John Hawkes, who owned a lease on the nearby Clogau and Moel y Faen quarries from the Wynnstay Estate. The Hawkes family stayed at the Abbey Grange until 1939, when the house was sold to a local farmer Edward Jones. He lived there until 1942, after which the Abbey Grange was bought by Ben and Glenys Evans who made it into the Abbey Grange Hotel. The hotel continues to be run by their son Steven Evans. 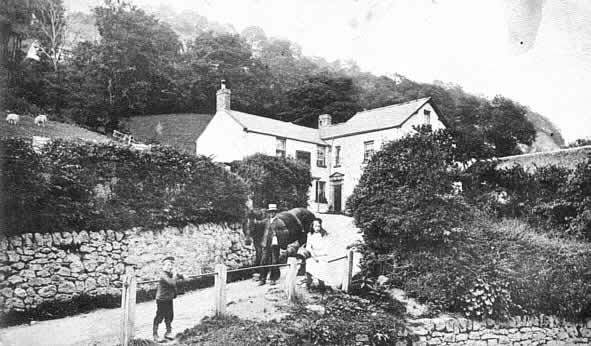 Other taverns in Llantysilio and Llangollen, some of which are gone and some still here but all of which have fascinating histories include the White Hart and Nags Head in Pentredwr, the Crow Castle, and Waterloo (below left) and the Jenny Jones (below right) and Sun Trevor (below centre). 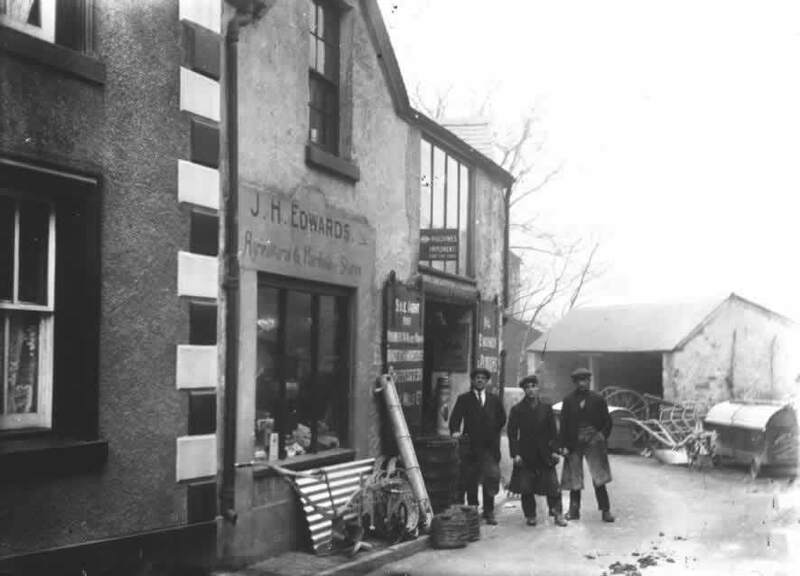 Although the surrounding villages did (and in some cases still do) have a few small shops, most retail outlets have always been in the centre of Llangollen. 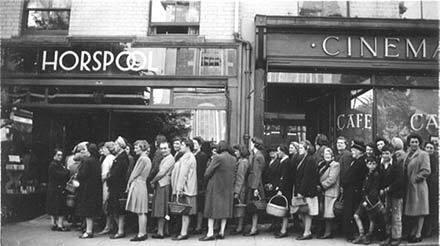 Whilst some of the everyday shops, such as grocers, ironmongers and butchers remain, many others like plumbers, shoe shops and clothes shops have given way to an increasing number of tourist events. 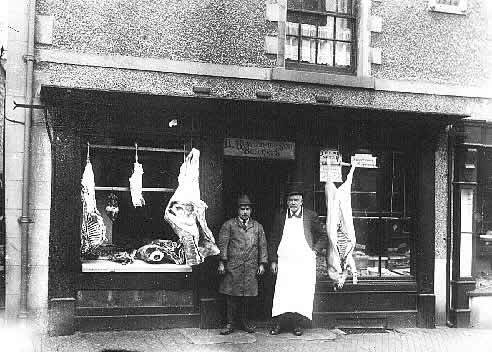 Below are shown just a few photographs from the turn of the 20th century of some of the shops that previously existed in Llangollen.